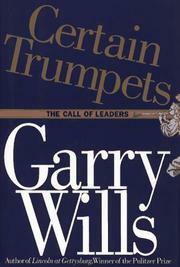  Wills (History/Northwestern) has written a stunningly literate and thoughtful examination of what makes a leader. The 1992 Pulitzer Prize winner (Lincoln at Gettysburg) has been pondering this question publicly in much of his writing, and the essays in this volume show that his work has not been in vain. Leadership is a quality that grows out of a reciprocal engagement between two contrasting wills. One leads, often in disguised ways, while the other follows, often resisting. Consequently, Wills says, ``leadership is always a struggle, often a feud.'' In order to focus on how that struggle is won or lost, Wills has devised 16 categories of leadership, ranging from elected to saintly, from sports to military, and has chosen one exemplar per category, offering a brief biography of each. In addition, he has chosen ``anti-types'' who lack the very qualities their opposites exemplify (e.g., in business, Ross Perot is the archetype, Roger Smith the anti-type; among intellectuals, Socrates and Wittgenstein; in the performing arts, Martha Graham and Madonna). There is an excellent chapter on rhetorical leadership, in which Wills writes eloquently of Dr. Martin Luther King Jr., offering a brief but powerful analysis of the famous 1963 March on Washington speech. Along the way, Wills supplies learned and incisive analyses of a wide range of topics relating to leadership: the writing of Machiavelli; a quick history of public speaking and rhetoric; and a startling dissection of how Franklin Roosevelt's polio made him a more effective judge of public opinion. Any one of the chapters could be expanded into a book, and one yearns to see Wills explore some of these figures in greater depth some day. In the meantime, this volume is a welcome antidote to some of the more egregious ``management style'' drivel of the 1980s.